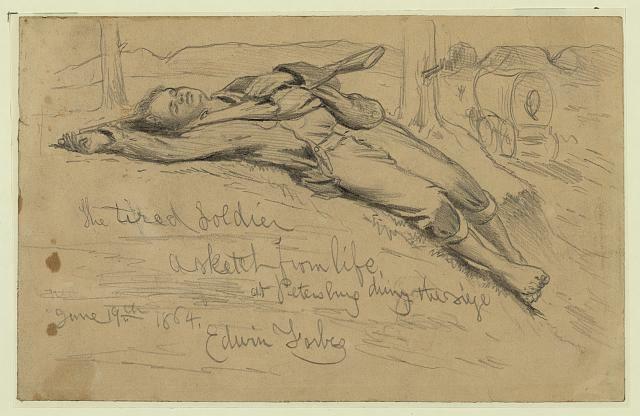 Edwin Forbes, The Tired Soldier – A Sketch from Life at Petersburg during the Siege, drawing in pencil, June 19, 1864. Library of Congress Prints and Photographs Division. Available online. When Dr. Foster diagnosed Tom with irritable heart, did he essentially diagnose him with the Civil War’s equivalent of Post-Traumatic Stress Disorder (PTSD)? Not exactly. During the Civil War, the word “trauma” referred only to an acute injury and did not carry psychological or emotional connotations. According to research by Edgar Jones and Simon Wessely, most physicians understood that an emotional shock or frightening experience might cause short-term distress, but long-term emotional distress indicated that the patient was predisposed to mental illness—probably melancholia or nostalgia. Da Costa never quite pinpointed the cause of the “peculiar functional disorder of the heart” he observed in Civil War soldiers. He speculated that their months of “hard service” contributed to their overall breakdown. In his landmark 1871 article about the condition, Da Costa wrote that, “the affection… is not confined to troops engaged in actual warfare… Soldiers kept long under drill, are liable to functional derangement of the heart with palpitation.” Da Costa’s insistence that it was army life in general, not combat experience per se, that generated irritable heart underscored his emphasis on the physical over the emotional. Several historians interested in identifying combat stress disorders in Civil War veterans have read Da Costa’s findings as PTSD by another name. They tend to focus on the bad dreams and excessive sweating that Da Costa observed in his patients. These historians read his use of the phrase “hard service” as a kind of euphemism for participating in major battles. Although irritable heart included some nervous symptoms, Da Costa classified these as the result of physical changes. For example, he explained his patients’ bad dreams as “indicative of disturbed circulation in the cerebro-spinal centres.” At no point in his writing on the condition did Da Costa describe anything close to the “fits,” anger, or terror that Tom displayed in Mercy Street. Despite Da Costa’s emphasis on the physical and the scientific, most nineteenth century Americans did not see the body and mind as wholly independent. Soldiers and civilians alike used language like “broke down” and “played out” to describe the complex blend of emotional and physical illnesses that plagued Civil War soldiers. Long after the war, veterans used these phrases in official documents to describe their personal experience of mental anguish linked to physical discomfort. Scholars and researchers have long looked to irritable heart as a kind of origin point for combat stress disorders but that overlooks the ways in which Da Costa ignored or excluded the soldier’s memories or emotional state in the diagnosis. Broke down soldiers might suffer from irritable heart but it was not irritable heart that broke these men. It is in descriptions of the “broken” soldier that historians find evidence of the long-lasting effects of Civil War combat. It was not until after the Franco-Prussian War (1870-1871) that physicians begin to consider that frightening events of war might have a long-term impact on the otherwise healthy body and mind. The first physician to study “hysterical men” was Jean-Martin Charcot, a neurologist based at Paris’ la Salpêtrière hospital. Interestingly, Da Costa studied at la Salpêtrière after graduating from Jefferson Medical College. The two men probably knew each other, at least as acquaintances, since Charcot served as the hospital’s “Chef de Clinique” from 1853-1856. In 1882, Charcot studied men whose symptoms sound a lot like irritable heart: palpitations, pain, difficulty sleeping, dizziness, and more. From Charcot’s findings, and the insight provided by Sigmund Freud’s research, physicians in the United States and Europe began to distinguish between various kinds of anxiety. This research also contributed to the identification of conversion disorders, in which a person experiences psychological distress through physical symptoms despite having an apparently normal/healthy body. Obviously, men can suffer from multiple physical and psychological conditions at one time. There’s no doubt that Tom suffered serious mental distress as a result of what he saw in the war and that his body gave out under the strain of army life. Army physicians found that sick men were more likely to develop nostalgia, a pathological form of homesickness tinged with depression, and that nostalgic men were more susceptible to disease. While these two disorders could be related, soldiers who suffered from one didn’t always develop the other. The link between the heart and the mind continues to interest military physicians. In 2014, researchers with the Department of Veterans Affairs found that combat exposure, even when veterans did not develop PTSD, was correlated to higher rates of heart disease. While this research provides today’s physicians with important insight into the health of veterans, it would hardly have been a surprise to nineteenth century physicians like Dr. Da Costa, S. Weir Mitchell, and the fictional Dr. Foster. While today’s physicians are not returning to the diagnosis of irritable heart, they are asking the same kinds of questions about how war alters a soldier’s heart (both as an organ and as the symbolic emotional center). Ashley Bowen earned her PhD in American Studies at Brown University. Her dissertation is titled “‘All Broke Down:’ The Physiological, Psychological, and Social Origins of Civil War Trauma.” Prior to entering graduate school, she worked for a variety of museums and public health organizations. Alberti, Fay Bound. “Angina Pectoris and the Arnolds: Emotions and Heart Disease in the Nineteenth Century.” Medical History 52, no. 2 (April 2008): 221–36. Anders, Charlie Jane. “From ‘Irritable Heart’ to ‘Shellshock’: How Post-Traumatic Stress Became a Disease.” i09, April 4, 2012. Accessed 1 November 2014 <http://io9.com/5898560/from-irritable-heart-to-shellshock-how-post+traumatic-stress-became-a-disease>. Bartholow, Roberts. A Manual of Instructions for Enlisting and Discharging Soldiers: With Special Reference to the Medical Examination of Recruits, and the Detection of Disqualifying and Feigned Diseases. Philadelphia: J.B. Lippincott & Co, 1863. Accessed 7 Feb. 2016 <http://collections.nlm.nih.gov/catalog/nlm:nlmuid-62430200R-bk>. Brandt, Dennis W. Pathway to Hell: A Tragedy of the American Civil War. Bethlehem: Lehigh University Press, 2008. Da Costa, JM. “On Irritable Heart: A Clinical Study of a Form of Functional Cardiac Disorder and Its Consequences.” The American Journal of the Medical Sciences 61, no. 121 (January 1871): 17–52. Dean, Eric T. Shook Over Hell : Post-Traumatic Stress, Vietnam, and the Civil War. Harvard University Press, 1997. Dror, Otniel E. “Afterword: A Reflection on Feelings and the History of Science.” Isis 100, no. 4 (December 1, 2009): 848–51. Jones, Edgar, and Simon Wessely. “A Paradigm Shift in the Conceptualization of Psychological Trauma in the 20th Century.” Journal of Anxiety Disorders, 21, no. 2 (2007): 164–75. Kumar, David R., et. al. “Jean-Martin Charcot: The Father of Neurology.” Clinical Medicine & Research 9, no. 1 (March 2011): 46–49. Wentworth, Bailey A., et. al. “Post-Traumatic Stress Disorder: A Fast Track to Premature Cardiovascular Disease?” Cardiology in Review 21, no. 1 (2013): 16–22.